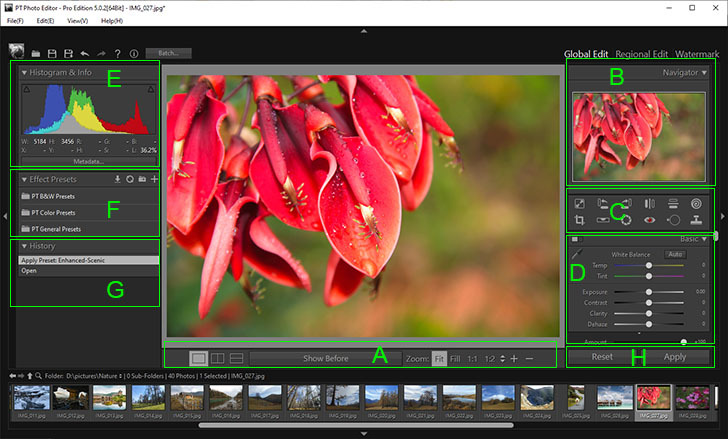 Global Edit Overview - User Guide of PT Photo Editor - Easily rescue problem photos. Make every shot its best. The Global Edit module contains all the editing and adjustment tools suitable for the entire image repairing and improvement. The View toolbar includes the Before And After Views buttons and Zoom Level controls. You can use Navigator or click & drag to pan the image within the window. The tools in the Tool strip let you crop and straighten photos, fix red eye, remove spots and unwanted objects, reshape face and body, and fix lens distortion. 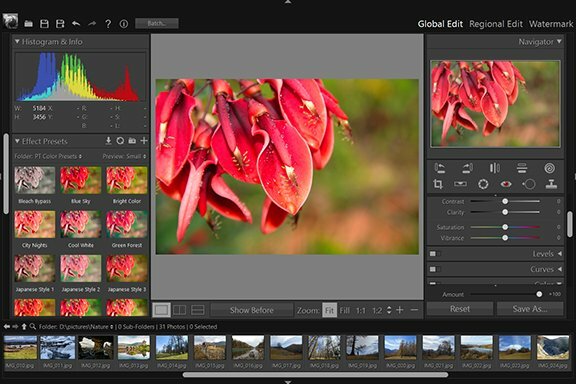 The Adjustment panels include a variety of tools for adjusting the photo's white balance, exposure, color, tone, detail and effect. The Photo information panel helps you measure color tones and RGB values. Presets provide a way to save a group of adjustment settings and apply them to other photos. Use the History panel to return to any previous edit. The Batch tool allows you to make similar changes to multiple images. You can convert, rename, resize and edit hundreds of images in one time.